Ever met someone with phossy jaw? How about painter's colic? Probably not, if you live in the West; the early 20th century saw a successful movement in the US and Europe to improve workplace safety and hold employers accountable for hazardous conditions in the manufacturing process. One of the scientists at the forefront of research on industrial medicine in the US was Alice Hamilton, born on this date in 1869 (image at right is her portrait on a 55-cent US postage stamp), in Indiana. She was a longtime resident of Jane Addams' Hull House, the first woman on the faculty at Harvard Medical School, an active member of the Woman's Peace Party, and she lived long enough to denounce McCarthyism and US involvement in Vietnam. Read here from her memoir how she became interested in industrial medicine, and the resistance she faced in trying to study workplace hazards (the quote above is an excerpt). 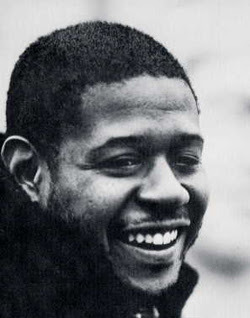 Forest Whitaker took home the Oscar for Best Actor in a Leading Role last night, for his portrayal of Idi Amin in The Last King of Scotland. Whitaker is hardly a conventional-looking actor-director: a noticeable strabismus (turned-out eye) and ptosis (drooping eyelid) have made him recognizable in a wide range of roles, and he has said that he thinks his appearance gives his characters more depth. It could have been repaired in recent years; even now, there are commentators asking if it should be. Whitaker has said he'd consider the fairly routine surgery to improve his vision, but not for aesthetic reasons. I am not going to argue that Ashley’s parents are immoral or unjustified in what they did. I will argue that they are no longer Ashley’s parents. Regardless of their love and affection for their daughter their decision to remove her breasts and uterus and maintain her in a state of pre-puberty is not a parental decision. It is more the kind of control one might enforce on a pet to manage the relationship. It is something a farmer managing the productivity of his or her operation would naturally enforce on livestock. This would be done humanely, morally, and no-doubt with considerable tender affection and love for the subjects. There would be no outcry and no controversy, yet no one would confuse these acts of husbandry as parenthood. Of course, some cultural forces can produce pretty warped definitions of parenthood--the examples are well-known and numerous. I just finished reading Lisa See's Snow Flower and the Secret Fan--it's set among women in 19c. China, among whom a "good mother" is the one who most skilfully breaks and deforms the bones in her daughter's feet with excruciating bindings. (I'm reading it as part of a book club attended entirely of mothers of young children--most of us have daughters just the age of the girls in the story, so it resonates and haunts at that level as well as other levels.) What warp in the cultural fabric makes the Ashley scenario seeming like a decent choice to so many people? Disability Blog Carnival #9 is up NOW! Mark Siegel posted the latest edition at the 19th Floor, as soon as he could ethically do so (ie, after work, not on the clock). It's up now and it's another fine collection of the latest in disability blogging, this time with an employment theme. Thanks to all who participated. Leila Monaghan is taking a turn at hosting the next Disability Blog Carnival, and the theme is..... HIV/AIDS and Disability. So, if that theme challenges you, write something, post it, and submit it before March 5; if you notice anything else that should be linked in the next carnival, submit that too--with a growing disability blogosphere, we have to alert each other to keep track of what's new and worthwhile. We're scheduling hosts for May and June now, if anyone is interested, they should contact me (leave a note in the comments here) to get a host assignment for a future edition. The World Health Organization (WHO) invites photographers and video producers world-wide to participate in a global photo and video contest -- "Images of Health and Disability 2006-2007". This year's theme focuses on "Health and Environment" an invitation to provide high-quality photographs and video clips, capture emotions and give your creativity free reign. The photos and video contest will contribute to WHO's global efforts to raise the awareness of the importance of ensuring healthier environments. Your photographs or short video clips should capture the positive or negative impact of the environment on people's health and functioning in their day-to-day life. Portray how a healthy and enabling environment can prevent or reduce diseases. Illustrate how environmental risks such as air pollution, poor sanitation, work-related stress, excessive ultraviolet radiation, chemicals, or built environments (such as streets, buildings etc) affect people's health, and hamper their functioning. Show how people and communities protect themselves from environmental risks, portray how people are living in healthy and enabling environments, or show how enhanced physical activity and public transport,and/or improved housing environment can make a difference in terms of preventing or reducing diseases. Photos can be submitted until 09 March 2007 in four categories: (1) Colour photographs (digital or prints); (2) Black and white photographs (digital or prints); (3) Digital Art photographs (images created or drastically manipulated by computer software or electronic filters); and (4) short video clips. In each category, prizes will be awarded from 100 to 1.000 US-Dollars. This contest is in its fourth year. It was launched in 2002 to coincide with the release of the International Classification of Functioning, Disability and Health (ICF) with the aim to promote the ICF understanding of health and disability. For competition rules, and further information download their announcement; entry form. Through the process of amendment, interpretation, and court decision, I have finally been included in 'We, the people.'" 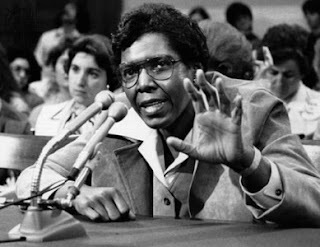 When I wrote up some notes on disabled members of Congress in the past, back in the fall, I didn't bring my survey far enough into the 20th century to include Barbara Jordan, born on this date in 1936, in Houston TX. Jordan earned a law degree at Boston University. In 1966, she became the first African-American woman to serve in the Texas Senate. She started her term in Congress in 1973--the same year she learned that she had multiple sclerosis. Important moments in her career included her service on the House Judiciary Committee, where she made a memorable televised speech in favor of Nixon's impeachment (audio and text available here), and her keynote address to the 1976 Democratic Convention. titled "Who, then, will speak for the common good?" (audio and text available here). Jordan left Congress for health reasons in 1979, was a professor at the University of Texas's Johnson School of Public Affairs, and died in 1996, at the age of 59. Before her death, she had lived for many years with her longtime significant other, Nancy Earl. Today, there's a Barbara Jordan Media Award given annually by the Texas Governor's Committee on People with Disabilities for "accurate and positive" coverage of disability issues in print and broadcast media. Today's Sunday Washington Post features a front page story on the administrative delays and outpatient challenges that war-wounded and war-weary soldiers are facing at the United States Army's top medical facility in Washington, D.C. The editors of DS,TU wish to express our gratitude to the investigative reporters Dana Priest and Anne Hull [email contacts] who spent four months conducting their undercover investigation of the out-patient world at Walter Reed. This is a major story that is getting heavy play in the blogosphere [see commentary of Pastor Dan]. Please share your thoughts with your congressional representatives; let them know that you care about the disabled veteran of conflict in Afghanistan and Iraq. We need to bear witness to and express our compassion for these men and women. Update: The fallout from this published expose has been swift. Following the resignation of the general in charge of the Walter Reed Medical Center, Maj. Gen. George W. Weightman, on Thursday, the news arrived Friday, March 02, 2007 that Secretary of the Army, Francis J. Harvey, had also been asked to resign by Defense Secretary Robert M. Gates. Today is the birthday of American poet and journalist Laura Redden Searing, born on this date in 1839, in Maryland. She became deaf before adolescence, after a bout with meningitis. Laura Redden attended the Missouri School for the Deaf beginning in 1855. 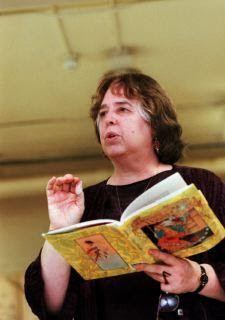 After school, she began publishing her poetry under the masculine pen-name "Howard Glyndon." She also worked for the St. Louis Republican, reporting from Washington DC during the Civil War, and from Europe in the later 1860s. She married a lawyer, and had a daughter, Elsa; the marriage didn't work out, and Laura moved to California with Elsa in 1886, when they attended a conference on deaf education and never returned East. 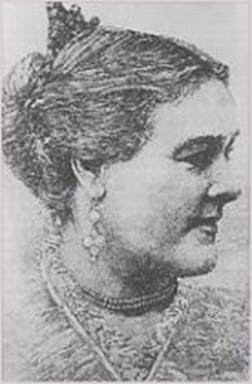 Laura Redden Searing was a proponent of the oral method of deaf education, although she herself never found lipreading a reliable means of following a conversation. Instead, she preferred the pen-and-paper mode, which means that her archived papers (in the Western Historical Manuscript Collection-Columbia) are unusually rich in records of everyday conversations, written on the back of envelopes and other scrap paper. Want to read more about Searing? Your best bet is Judy Yaeger Jones and Jane E. Vallier, ed., Sweet Bells Jangled: Laura Redden Searing, A Deaf Poet Restored (Gallaudet University Press 2003, part of their Classics in Deaf Studies Series). Or check out the May 2005 essay and interview from Poetry Magazine about deaf poets. 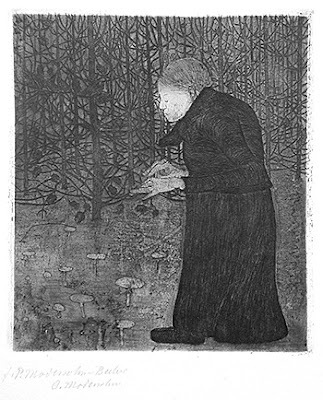 February 8: Paula Modersohn-Becker's "Blinde Frau im Walde"
Disability Blog Carnival #8 is UP NOW! 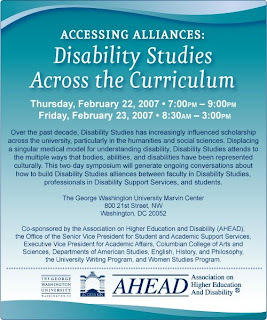 Head over to Daniel Goldberg's Medical Humanities blog to check out the latest edition of the Disability Blog Carnival, this time with the theme "Contact," which he interprets broadly, including posts on intercultural contact, contact and access to services, defenses against unwanted contact, contact with alternative ideas about disability... well, just go have a read. And get your submissions in for the next edition, hosted by Mark Siegel at the 19th Floor--his invited theme is "employment." The Carnival works best with robust and diverse community participation, so read, write, submit, link and comment away! Born on this date in 1904, in Behala, Kolkata, Indian painter and muralist Benode Behari Mukherjee. 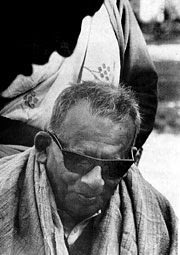 (Photo at left shows the artist in sunglasses; his name is also sometimes spelled "Binode Bihari.") He lost the sight in one eye at age 13; and in the other eye at age 54, in an unsuccessful cataract operation. As a young artist, he spent time in Japan, and learned Japanese watercolor and calligraphic styles that show in his later work. As an art instructor, he was part of the teaching faculty at Shantiniketan, except during the 1949-1952 years when he was curator at the Nepal Government Museum in Kathmandu. He wrote an award-winning memoir about being a blind artist, Chitrakar. In 1972, director Satyajit Ray (a former student) made a short documentary film about Mukherjee, titled Inner Eye. The artist's daughter, Mrinalini Mukherjee, is also an artist. This week is the final week of a major retrospective of Benodi Behari Mukherjee's work at the National Gallery of Modern Art in New Delhi. Ajay Sinha, "Against Allegory: Binode Bihari Mukherjee's Medieval Saints at Shantiniketan," in Richard Davis, ed., Picturing the Nation: Iconographies of Modern India (Hyderabad: Orient Longman 2007). Nemai Ghosh, Ray and the Blind Painter: An Odyssey into the Inner Eye (Kolkata: New Age 2004). We (my family and I) went up to Hollywood to walk/roll with the Not Dead Yet forces at the 2005 Oscars. I really didn't anticipate an encore this year. But Eastwood is getting the MPAA's first Jack Valenti Humanitarian Award at this year's festivities? Um....hmmm. 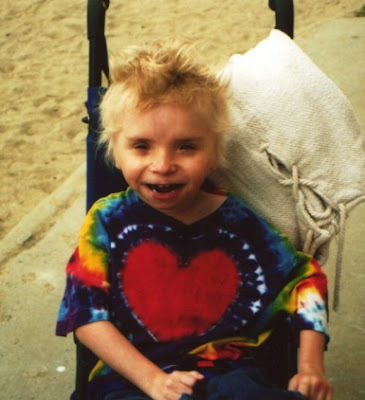 In 2005, Ragged Edge assembled a page full of links about why he's no humanitarian on disability issues. 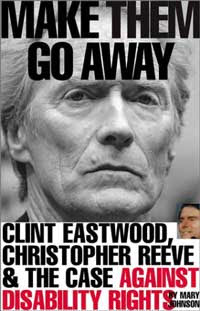 Or, for the long version, get a copy of Mary Johnson's Make Them Go Away: Clint Eastwood, Christopher Reeve, and the Case against Disability Rights (Advocado Press, cover shown at left). So,"decency and goodness of spirit," huh? Even aside from Million Dollar Baby and his ADA violations, this is still Dirty Harry, isn't it? I am forwarding an exciting announcement from David Mitchell, about a recent honor for the Chicago-based artist Riva Lehrer. What David doesn't say here is that he and his partner Sharon Snyder are at least in part responsible for raising the arts community's awareness of Riva Lehrer's work, through the DVD they produced and showed at film festivals and conferences across the country called "Self-Preservation: The Art of Riva Lehrer," 2004. Simi Linton showed parts of "Self-Preservation as part of her Mini Course "Approaching Disability Through the Arts" sponsored by the Institute on Disabilities last Spring 2006. Learn more about Riva Lehrer and her art on her website. For those who haven't heard -- Riva Lehrer's art was just awarded the prestigious Newhouse Award for artists of excellence. This is a monumental achievement for her work and disability arts in general. Please send her your heartiest congratulations! The Samuel I Newhouse Foundation announced today that Chicago artist Riva Lehrer is the winner of the first annual $50,000 Wynn Newhouse Award for artists of excellence. Ms Lehrer was selected from a group of eighteen nominees by a committee of persons respected in the arts community. This award was established by collector Wynn Newhouse, who believe this program can draw attention to the work of the most talented artists having disabilities. He hopes this award will expose the art world and the public to important contributions made by these fine artists. Ms Lehrer is currently on the faculty of the School of the Art Institute of Chicago. Her recent Circle Series, includes expressionistic portraits of powerful and successful creative persons with disabilities. Over the years Ms. Lehrer has explored the schism between "normal" and "different" in her art with powerful results. Four other artists tied as runners-up in this competition. They are: Darra Keeton of Houston and New York, Terrence Karpowicz of Chicago, Jonathan Sarkin of Gloucester and Sunaura Taylor of Berkeley. In addition to Mr Newhouse, this competition was judged by Cheryl Brutvan, Beal Curator of Modern Art at the Museum of Fine Arts in Boston, William A Newman, artist and faculty member at the Corcoran School of Art in Washington, Dr Olivia Raynor, scholar, author and Director of the National Arts and Disabilities Center at UCLA, and New York artist Dorothea Rockburne. The foundation will soon begin the nominations process for the 2007 Wynn Newhouse Awards. Questions about this awards program can be addressed to William R Butler by e-mail. Your chance of rescue from any despair lies, if it lies anywhere, in your eventual decision to abandon the death watch by the corpse of your old self and to search out a new inhabitable body. 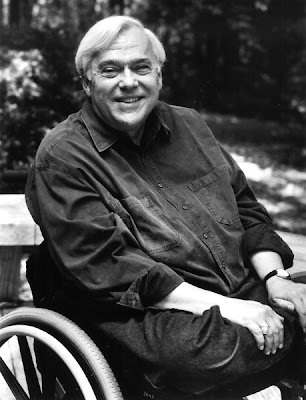 North Carolina writer, Duke English professor, former Rhodes scholar Reynolds Price was born on this date in 1933, in Macon NC. He's been using a wheelchair since the mid-1980s, when he survived a spinal cancer that was considered terminal by his doctors. His A Whole New Life: An Illness and a Healing (Athenaeum reprint 1994; also available as an audiobook) is a cancer memoir about the spiritual and psychological aspects of his recovery and pain management; Feasting the Heart: Fifty-two Commentaries for the Air (Scribner 2000) compiles many of his NPR essays, including several on disability ("Wheelchair Travel," "Eye Level to a Wheelchair," "The Last Great Weeper").